The Super Slam Showdown is the main pinball tournament of the South Coast Slam 2014. 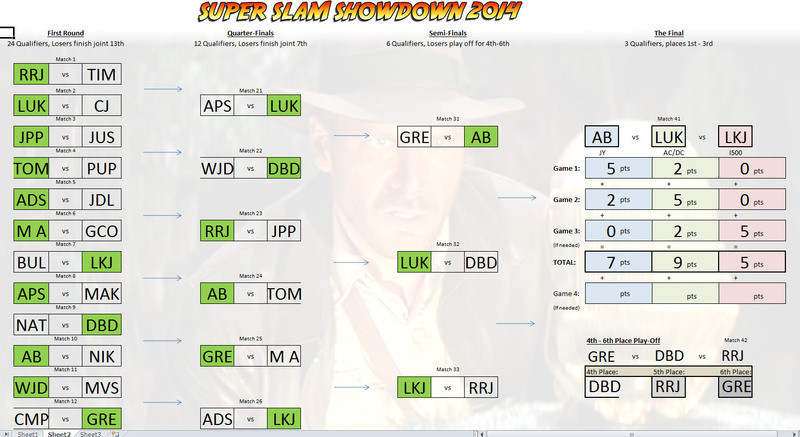 And the winner of the 2014 Super Slam Showdown is Lukasz Romanowski with Alain Boulieu second and Michel Dailly third. Here are the play-off standings. In the semi-finals were Greg Mott (GRE), Alain Boulieu (AB), Lukasz Romanowski (LUK), David Dutton DBD), Michel Dailly (LKJ) and Richard Rothwell-Jackson (RRJ). Alain, Lukasz and Michel progressed to the final, while Greg, David and Richard played for 4th-6th places. More details of the Super Slam Showdown and the rest of the South Coast Slam coming soon on Pinball News. Once again, the Pinball News team will have a selection of machines for you to play and qualify for the play-off rounds. The tournament is open to everyone and we encourage all Slam visitors to join in the fun. 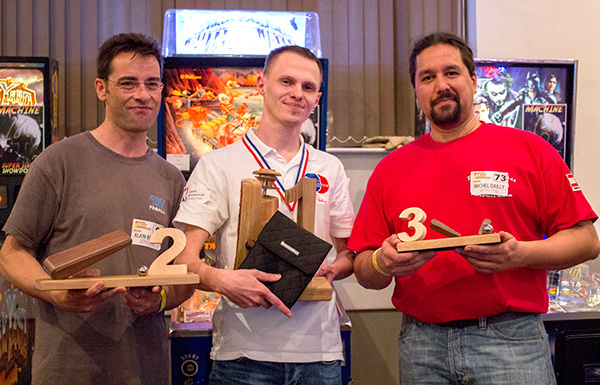 There will be trophies for the top players and everyone who takes part will earn World Pinball Player Ranking points. Due to the increasing popularity of the tournament each time, pre-registration was the only way to guarantee a place in the Super Slam Showdown. Pre-registration was open for the whole of March during which 102 players signed up and bought their entries at a special discounted rate. Pre-registration is now closed for the Super Slam Showdown 2014. A limited number of on-the-day entries will be made available at the Super Slam Showdown tournament desk from 10am on the Saturday, and will be sold on a first-come-first-served basis. For further details of how the format works, the overall rules, who has pre-registered, and how to get in touch with the organisers, just click on the links above. We look forward to welcoming you to the Super Slam Showdown at the South Coast Slam.